The theme this week was a lot more difficult that I had initially anticipated. Primarily because focussing on transparent glass is a challenge in itself. Let alone compose a shot that is artistic and well balanced. A number of the participants though were able to deliver some stellar shots. I did get some great tips on future shots and I intend to use them and hopefully get a chance to explain my process in more detail as well. And here is my crude attempt at recreating the shot. To achieve the water tilt look I stuck the glass to the coffee table with Blu Tack and then placed the table on an incline. 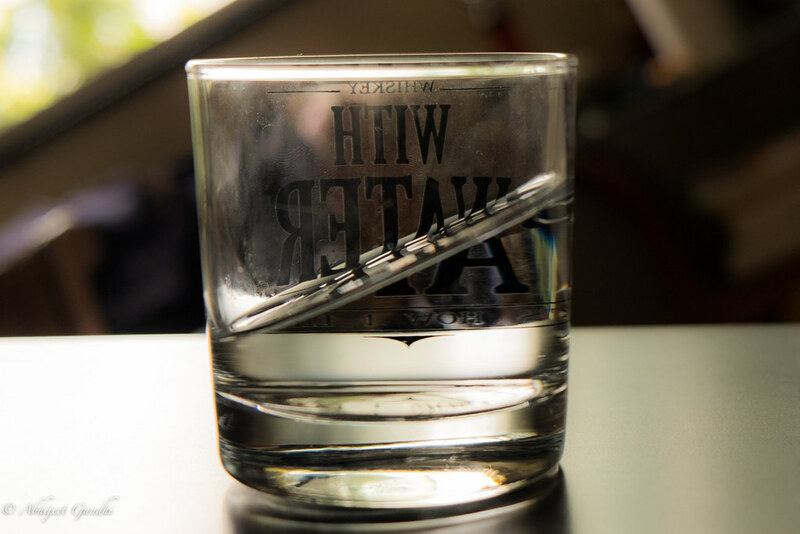 The shots were then rotated in Lightroom and cropped in a manner to achieve the illusion that the water in the glass alone is at an angle defying gravity whereas the glass itself is lying flat on the surface. A few tweaks on the exposure and shadows helped bring focus on the glass and balance out the colours. Not the best emulation of the shot, but it helped me flex my muscles (both physical and mental) and isn’t that what the challenge is about as well?